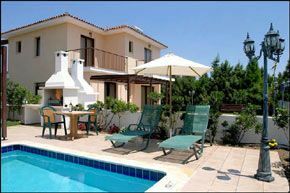 Master double bedroom with en-suite bathroom, hairdryer and veranda overlooking the patio and pool. 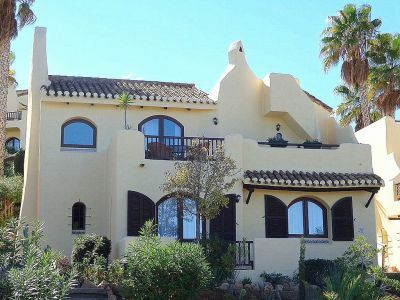 Two twin bedrooms, one with veranda overlooking the patio and pool, bathroom/WC. All bedrooms have air-conditioning/heating.Washing Machine. Large living dining room with satellite TV, DVD,CD/Radio, telephone, complimentary WI-FI internet supply and safe. Large French windows open on to the patio and private pool. 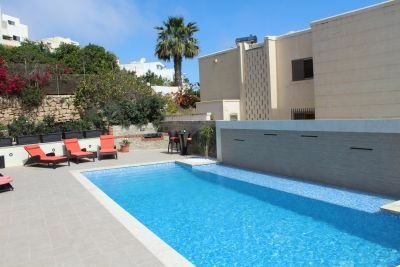 There is a separate fully equipped large kitchen/diner, with hob, oven, microwave oven, fridge/freezer, toaster, kettle etc. 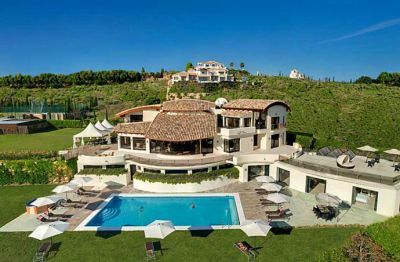 Each villa is set within its own private garden with a partly covered veranda, patio, private pool, garden furniture, umbrellas and sun lounges, built in BBQ, covered private car park. 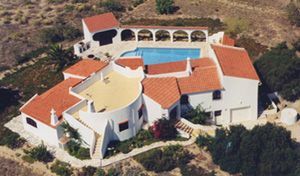 Daily cleaning and maintenance of the pool and garbage collection, weekly cleaning of the villa and change of linen, garden maintenance, tennis court, satellite TV, free WI-FI internet connection, complimentary initial supply of soaps and toilet paper, the services of a caretaker and housekeeper who live in the resort and is available 24 hours for emergencies. Extra maid service, A/C, car hire, transfers including meet and assist at the airport, grocery packs, laundry and dry cleaning, special requests like champagne and flowers, hairdressing/beauty treatments, massage in your villa, baby sitting, Doctor on call, Excursions & Cruises. 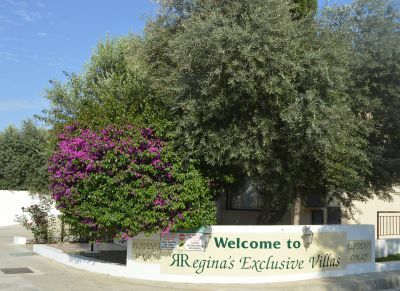 Regina’s Exclusive Villas are licensed by the CTO and owned and managed by John & Regina Xydas. The owners and some of the staff live on the premises and are ready to assist their clients at all times. John, (Cypriot) and Regina (French), met in the U.K whilst studying Hotel management. In 1979 after getting married they returned to Cyprus. Regina abandoned her career to bring up the family and John for almost thirty years was a General Manager of some of the leading five and four star hotels in Cyprus, like The Palm Beach, Adams Beach, Mediterranean Beach etc. Services include a caretaker who is always on hand, laundry and dry cleaning, cooked food delivered to your Villa, visiting chef, visiting masseur, baby sitting, doctor on call, tennis court, fax, E-mail and internet services. 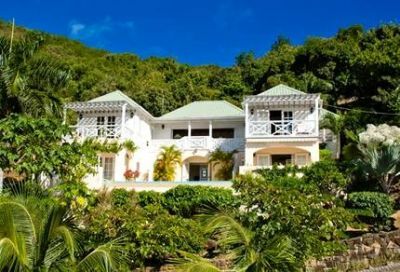 The location has been carefully chosen for its secluded privacy, access to services and amenities. Conveniently situated on the outskirts of Oroklini village with some views to the countryside and the sea (2 km) in the background. Our GPS coordinates are: N 34.98622 E 33.65973 The village itself, which is within walking distance, offers a range of shops, supermarkets, banks, chemist, medical centre, laundry & dry cleaners, bakeries, gym and bowling. Some parts of the village have been restored to the original traditional style and boast some fine rustic restaurants and bars. Oroklini public beach with diving, sailing, paragliding, etc some fine hotels is only five minutes away (2 km) and the centre of Larnaca fifteen minutes. A riding school offering show jumping, cross country, dressage and trekking is fifteen minutes away. The International Airport is twenty, Ayia Napa and Nicosia twenty five minutes, Limassol forty five and the Troodos Mountains an hour away. Please mention Internet Villa Holidays property number PID 6 on all correspondence.